When I found this pattern, I laughed out loud. It’s exactly the kind of thing I love to wear. It makes a statement, it’s silly, and it’s one of those things people will ask you where you got it. Then you can direct them to the free pattern and schedule some knitting buddy time. The whimsical pattern from Thelma Egberts on Knitty is available for free, and it’s a one size fits all type of hat. Sound too good to be true? Maybe a little fishy? Don’t worry, there’s no catch! One of the reasons I like this pattern is that it is so customizable. Have leftover bits of yarn? You can add them as stripes into the fish. 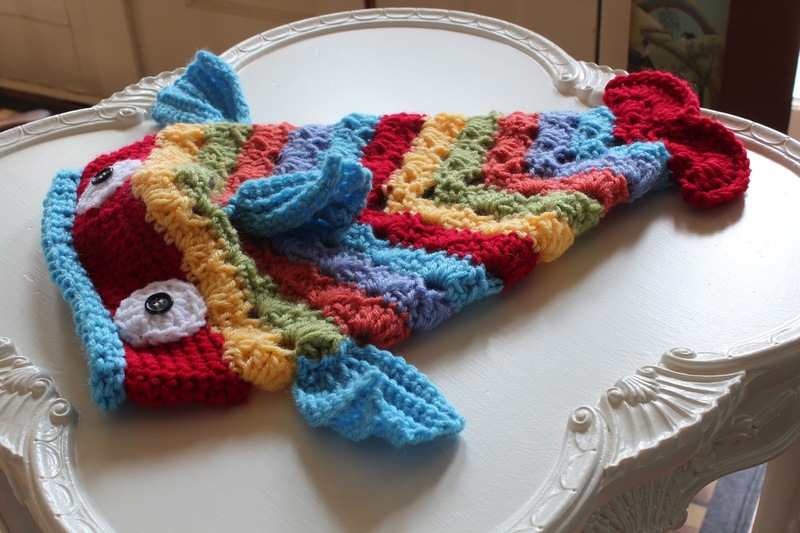 You can use any kind of yarn, any color, and if you want a live fish instead of a dead fish, all you have to do is put dots on the eyes instead of X’s. 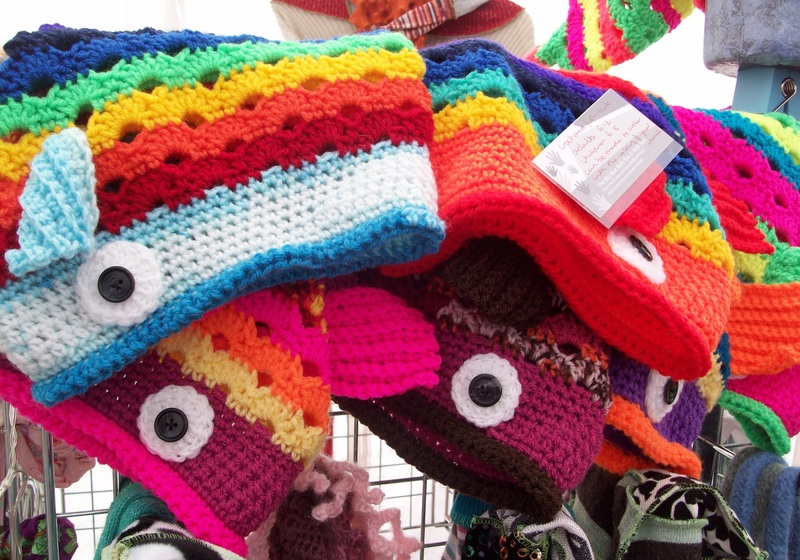 You can create a hat for yourself or a friend with your favorite colors, team colors, or even Harry Potter scarf colors. The pattern does recommend using a worsted weight yarn, or at least wool or acrylic yarn that will fit the gauge. It’s important to check your gauge with this pattern, because if you decide to go bigger, it will look like the fish is devouring your noggin. Too small, and it will look like it’s hanging onto your scalp for dear life. In order to check the gauge before you begin, use the stockinette stitch to knit 18 stitches in 28 rows. The resulting square should be about 4 inches. Once you’ve checked your gauge, gather the rest of your materials, which include: about 400 yards of yarn, one set of US #7 double pointed knitting needles (you can also use straight needles in the same size, though this is marked as optional in the pattern), stitch markers, a small stitch holder, sewing needles (big and small eye), embroidery floss (for the eyes), white felt (the embroidery floss will be used on here), white thread, and a pair of scissors. This pattern is for a more advanced knitter, as there are short rows involved, as well as decreasing on the double pointed needles. If you’re new to knitting, there are simpler hat patterns that are more accessible, but if you’re willing to give it a go regardless of your level of expertise, just make sure that you have a good knitter nearby to help you with any problem areas. Speaking from experience, knitting with double pointed needles and trying to do short rows can result in hair-pulling. 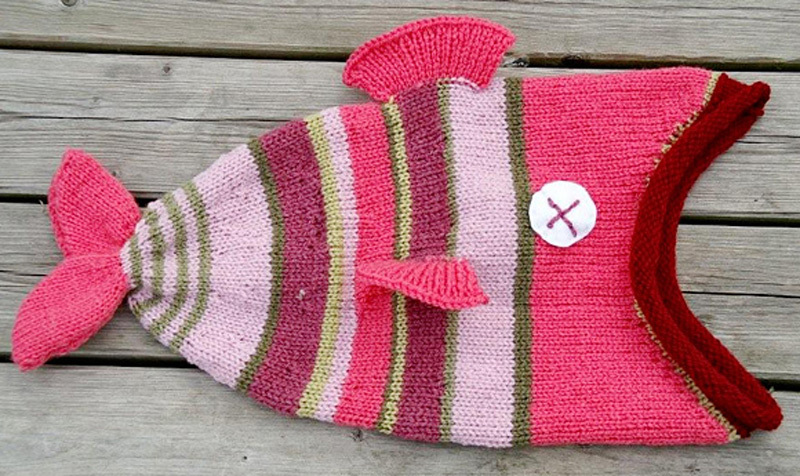 Ready to add fish heads to your next fashion statement? You can find the free pattern on Knitty.